Hans Christian Andersen’s 205th birthday celebration is April 2, 2010. This is always a popular print at my store. 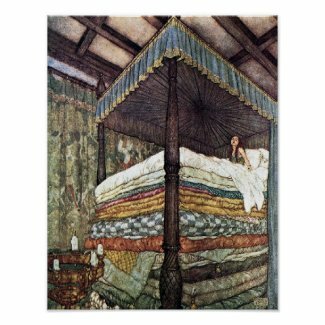 “The Real Princess”, or “The Princess and the Pea”, has been a Hans Christian Andersen favorite fairy tale from one generation to the other. The illustrator here is Edmund Dulac, a favorite artist, from “The Golden Age of Illustration”.